2nd Edition Now Available from Amazon! Coping with grief and loss is one of life's greatest challenges, and it can be hard to know how to reduce the suffering it brings. Mindfulness & Grief is your self-care toolkit, designed to help you cope with everything from sleepless nights to anxiety-filled days, while boosting your body’s natural resilience against stress. Combining inspirational stories of hope and healing with contemporary grief research, evidence-based meditation techniques, and the knowledge that each of us grieves in our own way, Mindfulness & Grief has helped thousands of people worldwide navigate the disorienting path of loss. Whether you are brand new to meditation or have been practicing for decades, Mindfulness & Grief will give you the coping skills you need for the short term, and help you cultivate a life of wellness and meaning, even in the wake of loss. Mindfulness & Grief is based on the 8-week program developed by thanatologist and meditation teacher Heather Stang. This program is accessible to anyone - regardless of physical ability - and does not require any previous meditation or yoga experience. Without proper support, navigating the icy waters of grief may feel impossible. If you are grieving, you may find it difficult to concentrate, as your mind struggles to make sense of your life after loss. Mindfulness meditation can restore hope and reduce your suffering by offering a compassionate safe haven for healing and self-reflection. 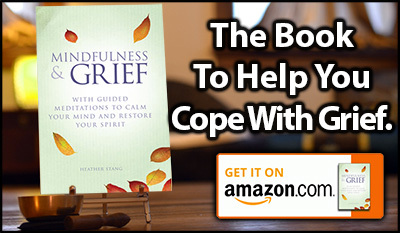 While nobody can predict the path of someone else's grief, this book will gently guide you through your unique experience of grief with simple mindfulness-based exercises to restore your mind, body, and spirit. These meditations will help you to cope with the pain of loss, and embark on a healing journey. Each chapter focuses on a different aspect of grief, and the guided meditations will calm the mind and increase clarity and focus. The reflective practice of mindfulness will help you to reframe your personal narrative and adapt to life after a bereavement. Intellectually we know we must release that which dies. But how? Mindfulness and Grief can accompany you in your grieving, providing wise and compassionate guidance that will support you in this profound and intimate process of letting go. Heather Stang offers considerable hope for those who might be lost to the process of grief. Not only does she offer hope – she offers ways to be with grief that are effective and that transform it at the same time. Embracing the moment and being present to what is happening rather than despairing in it are just one small but powerful aspect. I highly recommend this book. Heather Stang's Mindfulness & Grief is a must read and must have for those in grief and those who work with the bereaved and the traumatized. Mindfulness practices can help us hold what we think we cannot hold and bear what we believe we cannot bear. Heather makes learning and practicing mindfulness and meditation accessible and her approach is gentle and supportive. Her structure allows those who may be overwhelmed and in pain to take mindfulness one small practice at a time. For grief professionals, the practices are easy to implement and effective. As both a professional therapist and a grieving person, I highly recommend this book. Whatever effects one level of mind, body and spirit, effects all. 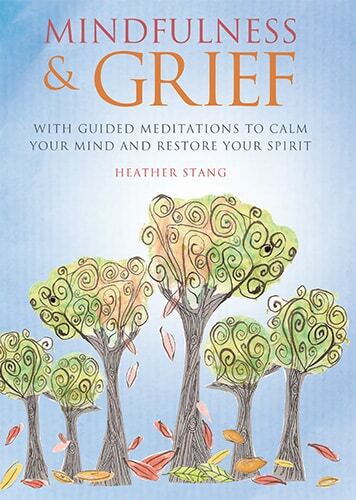 By combining current grief research with ancient healing practices, Heather Stang's Mindfulness and Grief adds an important voice to holistic grief healing. Perfect for the beginner, Stang offers instruction that is easy to follow and understand. This book is also appropriate for the experienced mindfulness practitioner as it provides a framework around using your established practice to work with grief and loss.... No matter your experience with meditation and/or mindfulness, Stang does a wonderful job of normalizing and supporting the grieving process. This is a great read for anyone, as we all experience loss in our lives."